admin December 26, 2018 December 26, 2018 No Comments on Ask A Vet: Why Does My Cat Pee Outside The Litter Box And What Can I Do? Feline Inappropriate Urination (urinating outside the litter box) is a common and frustrating problem. I see it regularly and it is complex and not easy to manage. Many cats are surrendered to animal shelters or destroyed because of this problem. To understand the complexity of this issue, we must first consider who cats are as a species and who we expect them to be as our house pets. It is a high expectation for a cat (who is descended from wild urine marking felines) to always urinate in a place that we have designated and it is our job to set our cats up for success by making this habit as preferable as possible for them. If your cat has always used her litter box and now is not, you must answer some important questions for her sake and yours. Could there be a medical reason for her habit change? This is the most important question that must be answered first. If your cat has a medical reason for inappropriate urination, like urinary tract disease, diabetes or orthopedic pain, these must be investigated and managed initially or all efforts to modify your cat’s behavior will fail. And even worse, an untreated medical problem can become a behavior problem that lingers long after the inciting cause if not promptly identified and managed. Once medical causes have been ruled out or managed, behavioral causes can then be explored and addressed. Causes of inappropriate urination can be related to aversions, preferences or marking/stress. Aversions (dislikes): Cats can develop a distaste for certain litter boxes, locations or types of litter. Ask yourself if you have changed anything or failed to clean the box as much as often. Maybe you are using a new cleaner. Have you changed to a new litter? Tried a new box? Changed your routine for cleaning? Preferences (likes): Cats can refuse to use a box if they prefer something be different about it. Some cats love a very clean box. Some cats like a covered box and some like an open one. Some cats like a quiet and hidden place for their box and if the owner has moved it, there might be a preference issue. Marking/Stress: If you have added a new cat or your cat can see a new cat from the window, he or she may by urine marking. This is even more likely if he sprays urine while standing. Have you moved to a new house? Sometimes you will not know what the specific cause is, but (as long as you know there is no medical problem) there are some steps you can take to try to head-off this distasteful practice. I am going to share with you the steps that I explain to my clients when they are dealing with Inappropriate Urination in an otherwise healthy cat. Number of boxes: Behaviorists and veterinarians say that you should provide one litterbox per cat in the home, plus an extra. This allows lots of options for the cats and if there is a territorial dispute that deters one cat from a certain box, you want to provide easy alternatives. Litter types: I tell people to set up a litter trial for cats, confining them to an area where litterbox use is the only option, like a bathroom or small tiled area. Give cats different choices of litter types and see which they choose. Many of my people like the fragranced clumping litters, but some of my actual patients (the cats) do not. Choose a variety of litters, clumping, sandy, clay, pine, etc. and make them available for a long enough time to tell what the cat chooses. While you are performing the litter trial, try to use similar open litter boxes so as not to confuse your cat. Litter box type: I had a patient that developed an inappropriate urination issue when his mom switched him to a self-cleaning litter box. She thought the expensive gadget would make his life better by keeping his box ultra-fresh, but he seemed to be afraid of the noise it made. Many times our cats will not conform to what we want and we are better off finding a compromise that we can all live with. Once you have established a litter type that your cat likes, you can make sure you choose the best box type too. Give your cat options. 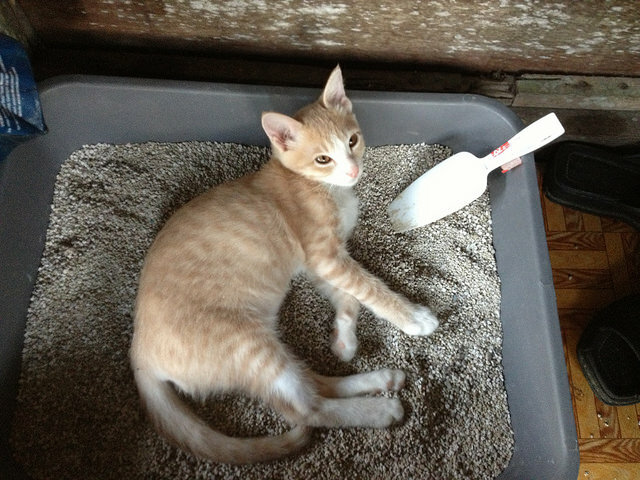 Choose easy to clean litter boxes, some covered and some not. Some should have low sides and some high sides and some should be large and others small (but all large enough for your cat to easily turn around in). Cleaning and cleaner type: Clean boxes by scooping at least once daily and empty completely and clean boxes each week. Use a mild soap and rinse thoroughly. If the boxes still smell after cleaning, replace them. You are encouraging your cat to make a choice that you like by offering good options, but you will probably also need to discourage the wrong choices. Make sure you find and clean areas of inappropriate urination thoroughly. You may need a professional cleaning service to help. Try to block areas where the wrong behavior has taken place and confine your cat to areas where the litterbox is the easiest choice until the habit becomes well established again (could take 2 weeks or more). Isolation will also help if your cat is stressed or marking because of another cat in your household or outside. It is always a great strategy to provide your cat with environmental stimulation. Our cats are descended from wild ones that hunt and patrol. They must use their brains and their bodies to survive. When we bring these animals into our home, it is our responsibility to enrich their environments as much as possible. I am a big fan of puzzle toys for all pets. Cats must figure out how to get the food reward by rolling or manipulating the toy. Make sure cats have places to scratch, climb and relax. Cats also need to be able to count on your for attention each and every day. Encourage exercise in every way. Play time and cuddle time are very important to cats’ social structure with you. After you have made sure your cat has no medical reason for the behavior, figured out which type of litter, location and box your cat prefers, reestablished good litter box habits by retraining and cleaned and discouraged the undesired locations, you should be well on your way to returning your home to a place that you AND your cat want to be. » This New Cat Litter Is Changing Lives For Owners And Their Cats!